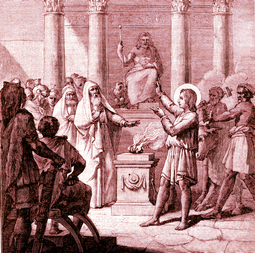 Saint Venantius, born at Camerino in Italy, during the persecution of Decius was taken into custody at the age of fifteen years as a Christian who was preaching Christ to others. His history is one of the most miraculous in the annals of the early martyrs. Having learned that he was about to be arrested, he presented himself to the governor of Camerino, Antiochus, at the city gates, and said to him that the lives of the gods were filled with every kind of crime, that there was only one God, whose unique Son had become a man to deliver his fellow humans from the tyranny of sin. When it was found impossible to shake his constancy either by threats or promises, he was condemned to be scourged, but was miraculously saved by an Angel. He was then burnt with torches and suspended over a low fire that he might be suffocated by the smoke. The judge's secretary, while admiring the steadfastness of the Saint, saw an Angel robed in white, who stamped out the fire and again set free the youthful martyr. This man proclaimed his faith in Christ and was baptized with his whole family. Shortly afterwards he won the martyr's crown. Venantius was summoned to appear before Antiochus. Unable to make him renounce his faith, the governor cast him into prison with an apostate soldier, who strove in vain to tempt him. Antiochus, furious, then ordered his teeth and jaws to be broken and had him thrown into a furnace, from which the Angel once more delivered him. The Saint was sent to a city magistrate to be condemned, but this judge after hearing his defense of Christianity, fell headlong from his seat and expired, saying, The God of Venantius is the true God; let us destroy our idols. When this circumstance was told to Antiochus, he ordered Venantius to be thrown to the lions. These brutes, however, forgetting their natural ferocity, crouched at the feet of the Saint. Then, by order of the tyrant, the young martyr was dragged through a heap of brambles and thorns and retired half-dead, but the next day he was cured; God had manifested the glory of His servant once more. On behalf of soldiers who had dragged him outside the city over stones and rocks, and were suffering from thirst, the Saint knelt on a rock and signed it with a cross; immediately a jet of clear, cool water welled up from the spot. This miracle converted many of those who beheld it. The rock remained imprinted by his knees and was placed in a church in Camerino, where it still remains. The governor finally had Venantius and his converts beheaded on the same day, in the year 250. The bodies of these martyrs are kept in the same church at Camerino. The Acts of Saint Venantius' martyrdom have been carefully studied and declared authentic by the Church. Reflection. Love of suffering marks the most perfect degree in the love of God. Our Lord Himself was consumed with the desire to suffer, because He burnt with the love of God. We must begin with patience and detachment, and eventually we shall learn to love the sufferings which conform us to the Passion of our Redeemer. Les Petits Bollandistes: Vies des Saints, by Msgr. Paul Guérin (Bloud et Barral: Paris, 1882), Vol. 5; Little Pictorial Lives of the Saints, a compilation based on Butler's Lives of the Saints and other sources by John Gilmary Shea (Benziger Brothers: New York, 1894). I praise Thee, Father... that Thou didst hide these things from the wise and prudent, and didst reveal them to little ones.